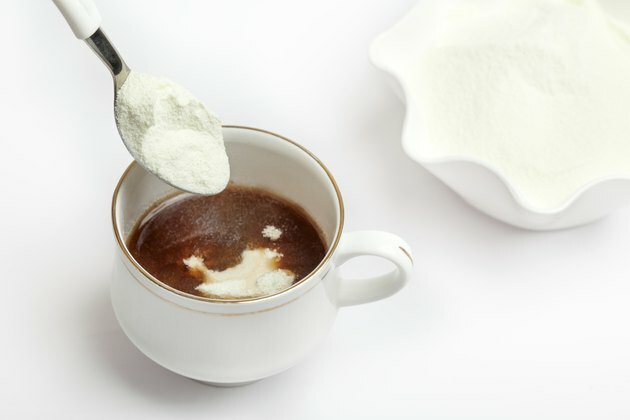 Powdered milk, a dry powder reconstituted to milk using water, serves as a non-perishable milk substitute, making it a popular choice for those stocking emergency supplies. The calories in powdered milk can help you meet your daily nutritional goals. A 1/4-cup serving of powdered milk contains 159 calories, according to the U.S. Department of Agriculture's National Nutrient Database. Based on a 2,000-calorie-per-day diet the USDA uses as a reference point, this accounts for approximately 8 percent of the calories you need daily. Some of the calories in powdered milk come from carbohydrates and protein, nutrients the the Institute of Medicine recommends consuming daily. You should eat 130 grams of carbohydrates and 46 to 56 g of protein on a daily basis. The National Nutrient Database reveals that a 1/4-cup serving of powdered milk provides you with approximately 9.5 percent of the recommended daily amount of carbohydrates and 15 to 18.3 percent of the recommended amount of protein. Powdered milk serves as a rich source of calcium, providing nearly 12 percent of the amount you need daily in a 1/4-cup serving. The Institute of Medicine recommends that you consume 1-1.2 g of calcium daily. Powdered milk also contains magnesium, phosphorus, potassium, vitamin C, vitamin A and vitamin D.